Making travel plans with your friends or going to another city for work? Before checking the maps, check your keyboard for weather conditions, for it is important to arrive prepared. 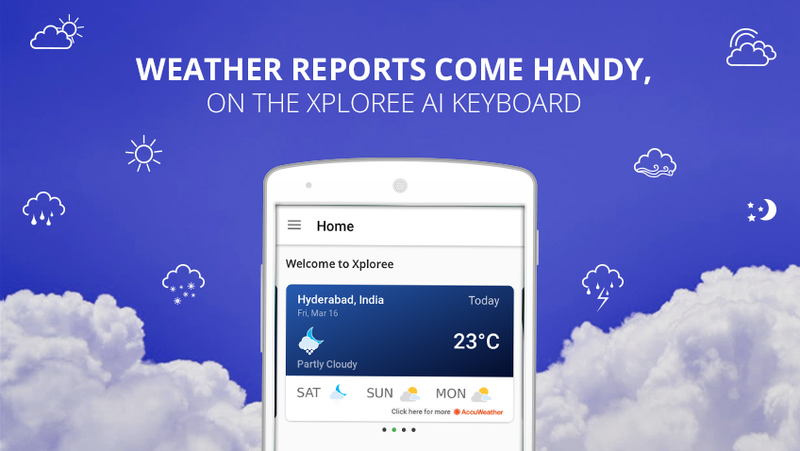 Users can now check weather report/conditions directly on their Xploree mobile keyboard. The keyboard’s AI algorithms automatically infers the city/country, the user is in, and tracks the local weather for them. So, users need not install separate apps for weather; for weather report will be directly delivered to the user on their Xploree AI keyboard. Xploree AI keyboard is also hyperactive while you type, chat or browse and gives you contextual recommendations, in real time. If you are discussing travel to another city or even different countries, Xploree’s AI algorithms are quick to capture the key words and show weather conditions of those places. Amidst all this, Xploree does not capture or store any kind of data. Everything is done one the device and on the fly. So, the keyboard picks up data only for the current active session. Once the user shuts the activity, the keyboard also forgets. Xploree AI keyboard understands over 180 global languages, including 50+ Indic languages. So even if the user types in their local languages, Xploree will intelligently pick up the context and provide real time suggestions. Apart from Accuweather, Xploree has over 50 partners like Hotstar, Housejoy, Hungama, Amazon, Times Now, AFP, Flipkart, and many more. Currently on 20M devices, this partnership with Accuweather is sure to delight the frequent flyers, also tickling the travel bug inside all of us.